Duette® Honeycomb Shades The introduction of the Duette honeycomb shade by Hunter Douglas in 1985 created the first new category in the window fashions industry in decades, offering optimum energy efficiency, light control and style possibilities. Their honeycomb construction traps air in distinct pockets, which creates insulation that can help lower your energy consumption and energy bills. GORGEOUS FABRIC OPTIONS Duette® Honeycomb Shades are available in numerous colors, patterns, and textures to match any decor. Find a luxurious fabric to create window treatments that enhance your interiors, while insulating and providing light diffusion and privacy. Honeycomb Shade are available in a single-cell design as well as the industry-leading Duette Architella®, which features a honeycomb within a honeycomb for maximum energy efficiency. Hunter Douglas introduces the NEW Duette Architella Collection, an evolution in honeycomb shades! The unique honeycomb within a honeycomb construction provides deep, luminous color, true opaque appearance, improved pleat retention, softer touch and higher R-Values (up to 38% greater than comparable pleats!) – a genuinely distinctive option over any other shade in the market. These shades can even reduce outside noise. Innovative design and a beautiful style set these shades apart for homeowners looking to add beauty and functionality to their window treatments. 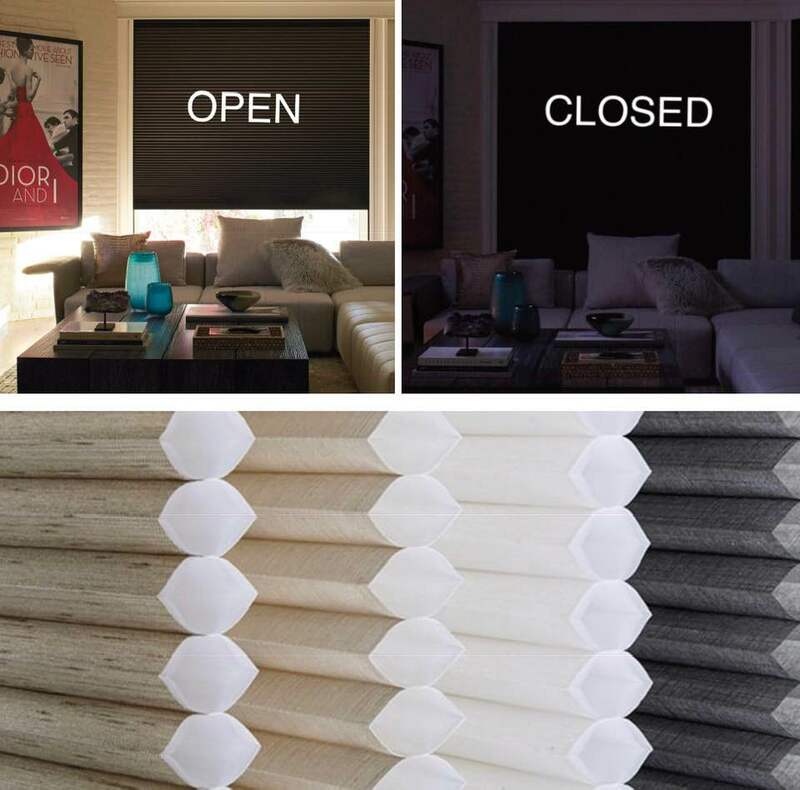 Lovitt Blinds & Drapery has a wide selection of colors and styles to match the decor of any home. Duette Duolite® Energy-efficiency, meet manageable light control. With a seamless, integrated design, Duette Duolite fuses two different fabrics together into one shade, allowing you to control the temperature in each room, while also beautifully filtering light during the day and providing darkness when you sleep. The Duolite option is also available on Applause Honeycomb Shades as well as our Pleated Shades. Duette® Honeycomb Shades with LightLock™ use unique U-shaped side channels that overlap the front and back of the shades. The secret to the adjacent room darkening lies within the patent-pending side channel design—which features rows of specially shaped micro-ridges, optimized to absorb or deflect nearly all incoming light while preventing the glaring from seeping into the room. Now Duette Honeycomb Shades come available with LightLock™. This incredibly new, patent-pending feature is the first of its kind to offer 100% total darkness. LightLock™ is an excellent option for those who need total darkness while sleeping. Use in your bedroom for complete night-time darkness, or in your living room to make napping on the couch all the easier. Use in your media room to ensure there are no distracting glares on your television. Those with a home office could use LightLock to prevent the sun from casting a gleam on their computer screens. Get LightLock, a one of a kind window treatment feature with Lovitt Blinds & Drapery today! PowerView® Our brilliant wireless operating system gives you the power to control and schedule your Hunter Douglas window treatments via remote control or your mobile device, and creates a safer environment for homes with young children and pets. UltraGlide® Features a single retractable cord or wand depending on your window treatment choice. The cord and wand always remains a constant length when raising and lowering your window treatments. With no long, dangling cords this system offers enhanced child and pet safety. EasyRise™ Pulling down on the front of this continuous loop lowers your shade. Pulling on the rear of the loop raises it. SimpleLift™ Offers enhanced safety for children and pets. The contoured bottom rail makes raising and lowering simple, with no handle required. TrackGlide™ Made especially for European style tilt-turn windows, the TrackGlide system with Duette Honeycomb Shades keeps shades in place when windows swing like a door or tilt from the top.